Another curate's egg of a day where passengers arrived through the service day to provide a satisfactory income. 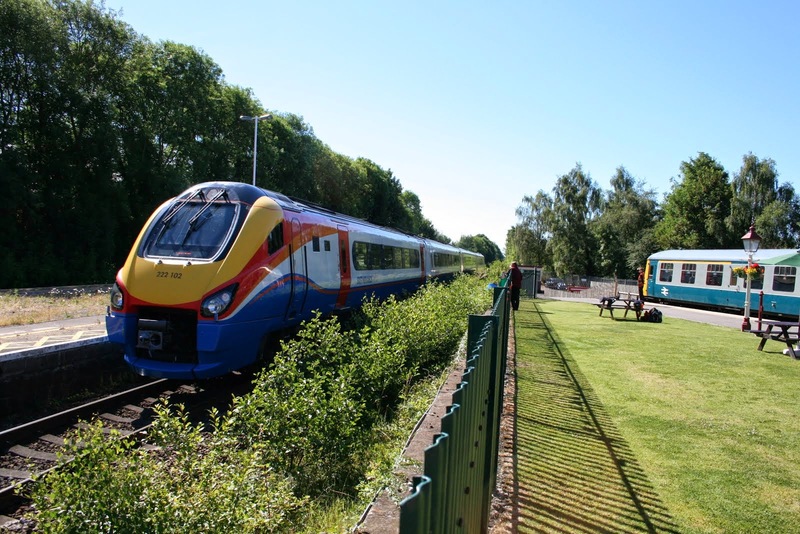 Both today and yesterday potential customers were marooned on Duffield's Main Line platforms unaware that the Matlock branch trains had been replaced by buses. It is an ill wind as a goodly number who were just looking for a day out, or heading for Peak Rail, were pleasantly diverted to the joys of Wirksworth. There's nothing like having a switched on team at Duffield! The PWT have reached a stage where Shottle South Junction is largely complete and Alan Taylor joined the SBT to erect a selection of restored enamel signs to the fencing there and put another replica "Shottle" running in board so that it is in the era of the LMSR. There was a tremendous amount of shunting and fuel consumption as the dmu fleet was moved to facilitate the return of Cathryn's wheels that were required under cover. The dmu team orchestrated all of this and completed a "Fuel Point" exam on their Class 119, rectified a fire alarm fault on 51188 and thoroughly wash the Class 119. 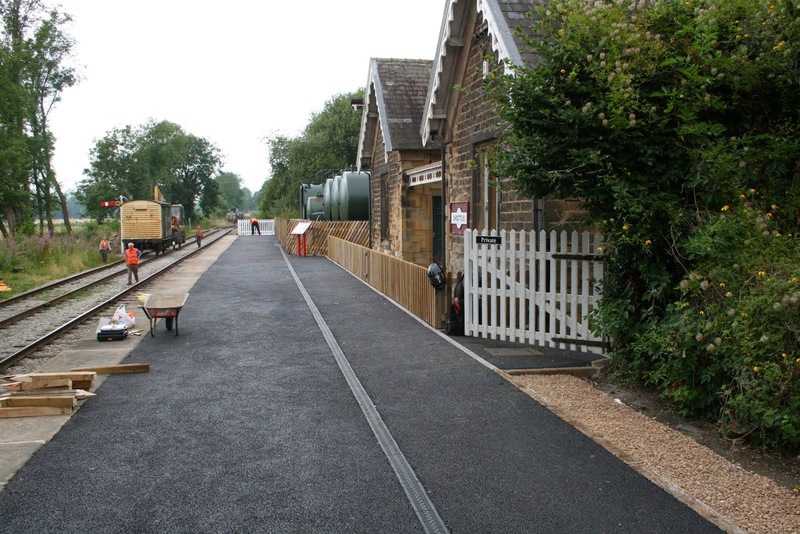 At Duffield yesterday there was activity within the bounds of possibility to reduce the invasion of vegetation from the area of the Down Slow platform and some filling of pot holes in our car park. The M1M continued with rewiring their SK and assisted with the delivery of Cathryn's wheels. We welcomed our "walking stick" customer and the dmu team planned to go down the line this evening to lop overhanging branches which were risking their paint finish. 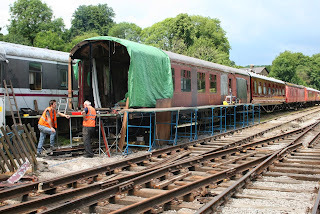 Further work went on to try and bottom the malfunctioning air conditioning on the Pullman First Open.. The Pullman Buffet Car entertained a unexpectedly large number of customers for lunch which was the unfortunate product of a malfunction in our administration where the source of this problem has been identified. I take my hat off to the catering team for smoothing out this potential crisis and I hope the measures taken ensure our passengers were not to disappointed did the job. PPS - I hope the people that have subscribed to shares this year, continued to support ShareSave and the Capital Projects Fund are content with how their money has been invested. 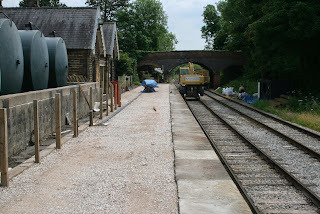 Some £11,000 has been spent on permanent way materials as part of the preparation work for the extended Maintenance Facility, £8,000 on drawing the Shottle Station reopening to conclusion and £6000 in providing a long term solution to the Permanent Way Team's all year round transport and accommodation. Without this financial support we would not have been able to move on any of these projects. This year's capital has now been exhausted! Our first Wednesday of the season played to mixed results but ended up a reasonable day. The service trains ran as planned and were supported by the EVRA Shop and Model Railway. 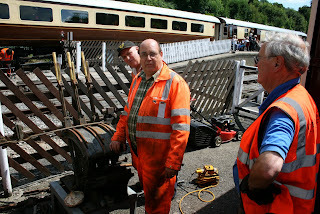 They also entertained today's Driver's Apprentice and guest who were very pleased with their time at our Railway. 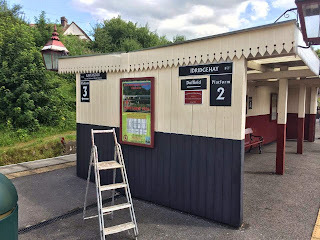 The Cooke team continued with the refurbishment of the Platform 2 & 3 waiting shelter and the leading Cooke, otherwise known as the LCC, tended to her normal tasks of carriage cleaning. The week's track patrol was completed with the Gorsey Bank to Ravenstor lines completed with much tightening of fishplate bolts proving that this fortnightly process is critical to the safe operation of the line. The LMSCA were out in force achieving a number of tasks on their BTO and TO reporting a most productive day. The was an air of slight panic as our chef, Martin, had to dash off with a family crisis whilst Anne Boultbee held the enterprise together to ensure today's passengers could be fed and watered. The Booking Halls at Wirksworth and Duffield had a productive day to our mutual benefit. Another photo from yesterday as it did seem quiet today after the show. I omitted from yesterday's report the sterling work done be Richard on weed patrol at Duffield, Idridgehay and in Wirksworth Yard. Also yesterday Rodney tended to the Duffield end of our activities with splendid sales of refreshments, watering the lawn and attempting to cut down some of the vegetation that is outside our territory on the down slow line by extended loppers. Today saw track patrols deal with the whole line between Duffield and Wirksworth just leaving the Incline for another day. The service trains ran with the help of a joint effort to provide the third man's job. My thanks go to Eric Hills who turned out for the afternoon after being on nights - dedication. 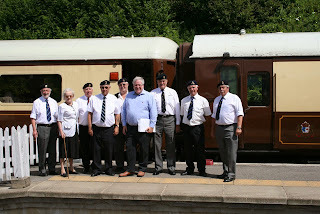 The service was supported by the EVRA Shop and the Pullman Buffet Car that looked after a small party with a number of wheelchairs and a full house of Afternoon Teas. The dmu team had a day of washing their vehicles and dealing with a fire alarm fault. The LMSCA continued their renovation of the south end of the BTO and the DST prepared No3 for next week's boiler inspection. Cathryn enjoyed the fitting of a stretcher plate to her frames. The PWT reported that the rodding has now been installed for Shottle South Ground Frame leaving some final adjustments to be made tomorrow. The SBT breathed a sigh of relief in that all required fencing has now been completed as their planned wind down is on schedule. The Booking Halls at Duffield and Wirksworth had a lively day with the phone at Wirksworth being a continued constant companion through the day. Today was all about the British Legion Wirksworth Branch as we helped them commemorate the start of World War 1. They put their heart and soul into the day which was blessed by hot, sunny weather and we played our part by delivering our range of services. We fielded our normal schedule together with Henry Ellison suitably enhanced by of wreath and British Legion flag and I am most grateful to the train crews that entertained all our visitors. Wirksworth station was very well decorated with Union Flags and we had representatives of the Scout movement and Army Cadets. 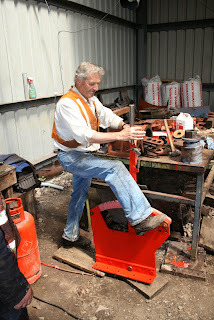 The LCC dispensed footplate experiences on Henry Ellison that were well received. 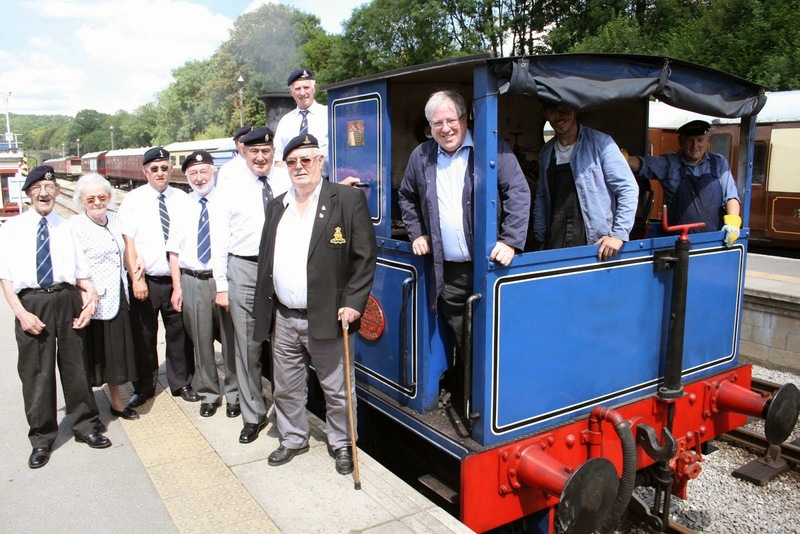 Our day was enhanced by a visit form the Secretary of State for Transport, Patrick McLoughlin, who is also our local MP and we completed his final driving experience with us after featuring with the Class 33, a dmu he has now driven a steam engine at our base. 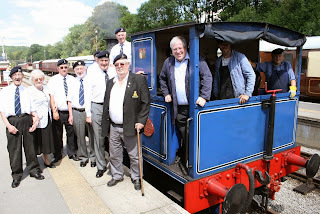 He is pictured with the British Legion team after his steam run and outside the Pullman towards the end of his visit. The dmu team made sure that today's units were in the right place and addressed a fire alarm problem on 50599. There was a general air of enthusiasm for the day and we certainly reached a new audience. The Pullman Buffet Car had to call for additional resources to feed and water all our visitors and the Booking Hall raised a surprising amount of money as the day went by. PS - a video is to follow! Another beautiful sunny day where the passenger trains pottered up and down gently with plenty of happy passengers onboard. 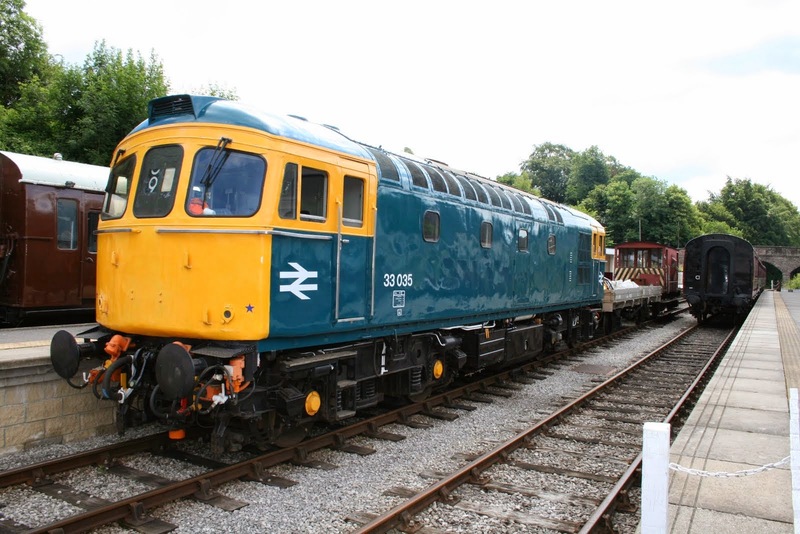 The DMU team worked on 50253 in the yard and some tinkering continued on the complex FO air conditioning problem. Jon touched up the booking office paintwork quietly this afternoon. Just a note about this week, we have lots of operating days this week and there are some positions left on the rota. There are a couple of Third Man turns Tuesday and Wednesday but also importantly, we need a driver and guard 1 on Tuesday. Please e-mail the rota system if you can help. A sweltering day during which we entertained a number of hot but happy driver experience guests. Down the yard the LMSCA proceeded with their roof vents on their Brake Third Open and baked gently under the tin roof. JCB Purves stripped some poster boards on the front of the Booking Hall ready for a further repaint. The usual summer mowing and weeding took place with the usual suspects faint from the heat. Inside Track attended for their charter and a jolly good time was had by all. Another hot and steamy day which demonstrated how much our weekday running this year caters for a latent market. Trains were well filled and I am very grateful to Eric Boultbee that ensured the vital third man job was covered. This activity opens and closes the level crossing gates at Gorsey Bank and Idridgehay which requires four gates to be opened and closed for each journey and probably is the least popular job on the operational railway but quite essential to operate our timetabled services. Today's service operated with the support of the EVRA Shop and customers seemed relaxed in the summer sun. 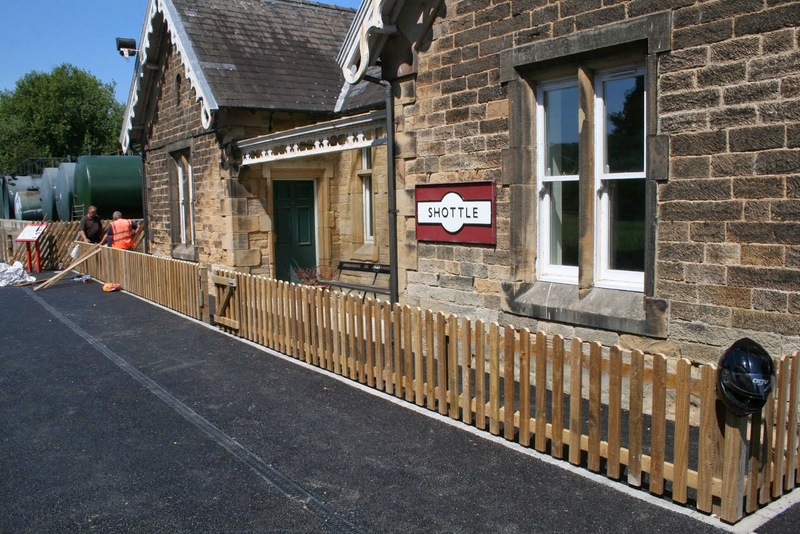 The PWT have divided their time between Wirksworth and Shottle as they refurbish and rescue all the various parts for the ground frame installations reporting that further rodding has been installed at Shottle. All this gear is of some vintage accumulated over our recent history but not in the best of condition when received requiring a deal of effort to make it reusable. Today's photo shows the Wirksworth part of the team wilting under the heat. The dmu team completed the "A" exam on 51188 and the Booking Halls at Wirksworth and Duffield had a most pleasant take as customers poured in. 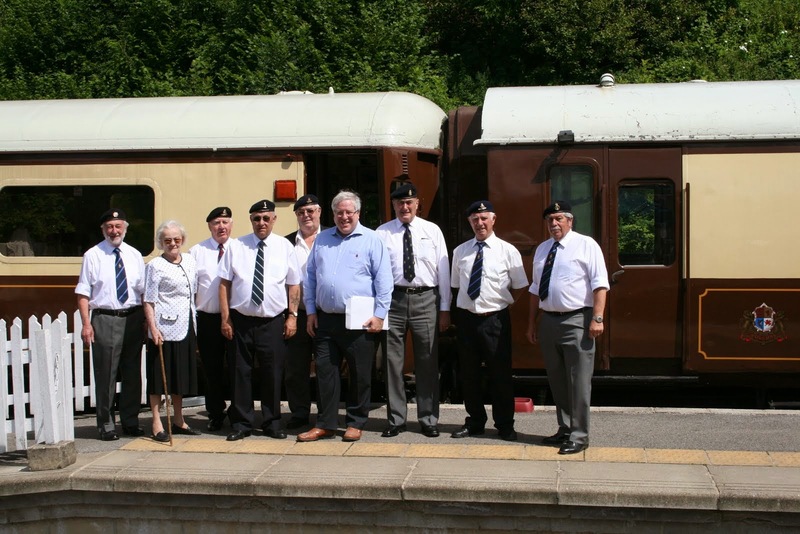 Today's heroes were the Pullman Buffet Car team who not only dealt with Station Master's VIP Luncheons and a party of Senior Citizens for an afternoon tea in unbearable conditions as both the First and Second Open air conditioning gave up. The flying fitter in the shape of Tim Moore managed to cool down the senior citizens later in their meal and I am most grateful for his intervention. 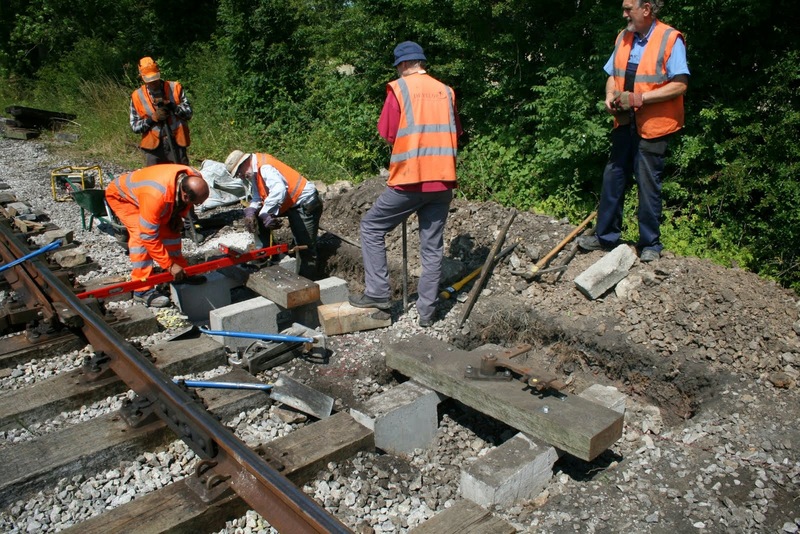 Another delightfully warm and sunny day with the second day of the derailment assessment course passing without incident although they were briefly joined by our regular walking stick customers which combined to put a large wedge into our coffers. 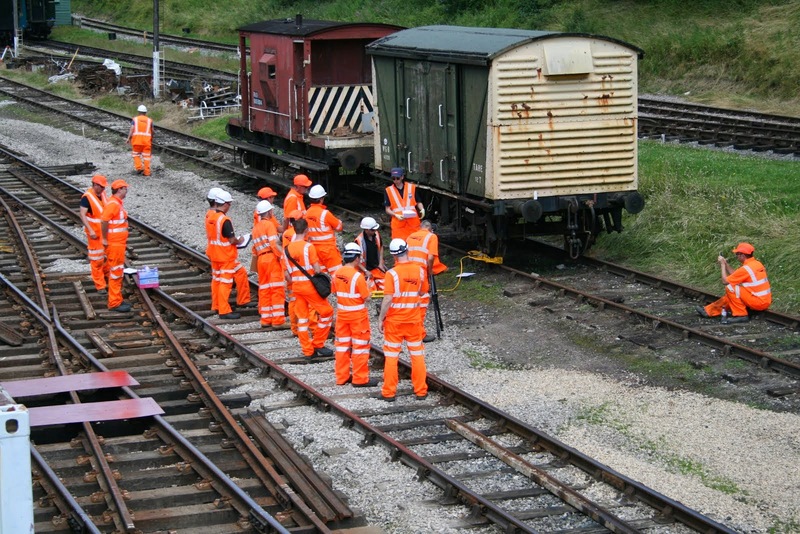 The LCC checked the available rolling stock and, after being satisfied that they were in good condition, joined the other two Cookes to make a determined effort to complete the refurbishment of the Platforms 2 & 3 waiting shelter. They are doing a splendid job to return this feature to its original smart appearance. Richard achieved more weed treatment around the station yard at Wirksworth including some wild growth on the Wash Green dock before giving the approach track to Hazelwood VCT depot a good do. The LMSCA achieved more welding on their BTO and 51188 received a power wash of its underframe areas which is part of the prevention of underfloor fires as a result of a build up of oil and fuel beneath the vehicle. The PWT and SBT were busy at Shottle with much fencing to protect the privacy of Peak Oil and the fitting out of the benches for the south ground frame The standard of work is very high as you would expect in conditions of great heat so unusual for our part of the World. The Pullman Buffet Car entertained our assessment course customers for lunch together with sundry visitors to site today. The Booking Hall processed yet more forward bookings and welcomed today's visitors that were brought out in the warm sunshine. A sweltering day that must have broken a few Derbyshire records. Today's photo show some of the very large team that attended the third derailment assessment course on their first day with us. 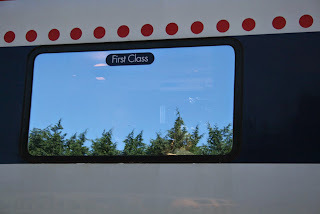 The service worked well with a coach party on the first train from Duffield, many upgrading to first class given the quality of the vehicles provided! The EVRA Shop and Model Railway provided further points of interest for our customers. We also entertained a Driver's Apprentice with his guest. The Pullman Buffet Car catered for our different guests included some 26 Afternoon Tea customers where we somewhat embarrassed by the high temperatures reached in the First Open which will require further thought if this most unusual summer continues. Sods law dictates that when a solution emerges months and months of cold, wet weather will descend! The DST had to cleanse their pit of ash, prepare Henry Ellison for Friday's driver experience day and continue with the repairs to No3's vacuum ejector. 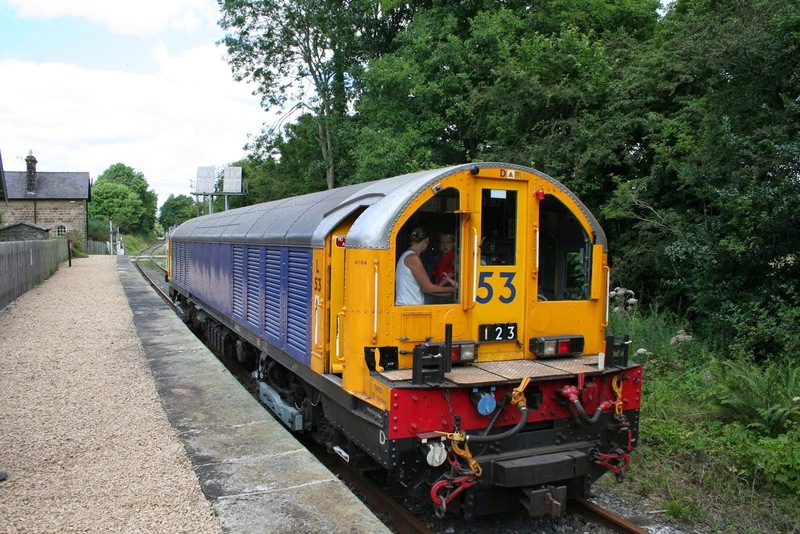 The LMSCA pressed on with the BTO and the dmu team commenced an "A" exam on 51188. Fred & Iris gave the Mess Hall a good do and tended to the flower tubs whilst the PWT renovated many parts associated with the Shottle Ground Frames project and planted benches at Shottle. The Booking Halls at Wirksworth and Duffield had a good day with Wirksworth dealing with today's passengers as well as future bookings. A splendid day all round. PS Thanks go to Mike Billings who completed the flailing yesterday of all the sight lines associated with our many footpath and accommodation crossings. A glorious day allowed for Honeysuckle gloss and dark undercoat to be applied to the waiting shelter on Platform 2/3 by Nathan and Support Crew. Splendid it looks too, even in undercoat, as you will see in the attached photograph. Down the line the VCT attacked vegetation which seems to be thriving in the damp and humid conditions and in the yard the vehicles were carefully placed and the track marked up for some training exercises which are going to take place this week. The Booking Office took the usual array of phone calls and the DMU Group proceeded to give a full exterior wash of 50170 (which was very dirty) after doing the morning shunt. The interior windows were given a clean too. attending the Classic Vehicle gala, some making up for yesterday in rather wetter weather. The sound of our trains running to time without fuss or bother was the main source of interest. watering system by Stokes Greenfield Industries. The Gods were not kind to us this morning as the heavens opened with torrential rain for the start of our Classic Vehicle Weekend. Still a surprisingly high number of hardy souls braved the monsoon conditions and paid us a visit. The miniature and model railways were open and the buffet ably coped with today's demands. Grateful thanks to the operational staff who, despite the atrocious conditions at times, ensured all our train services ran to time and our passengers enjoyed a safe and comfortable journey along the valley and up the incline. Finally, I would like to end this report with a feel good factor. The Bird Man of Mickleover AKA Graham Walker found a baby Chaffinch under one of the LMS Brake Vans. Obviously lost and looking for its parents, our DMU ornithologists went into action and following a few phone calls and a visit to the local vets, Charlie the Chaffinch has been adopted by a veterinary nurse who will look after him until he is ready to make his own way in life. Well done lads! Here's hoping for a bumper crowd tomorrow when sunnier weather returns. sweltering. We chuffed up and down with our gold experience guest and I am most grateful to all involved for their help. Down the line at Duffield the staff had an extravaganza of painting and gardening, and back at base the LMSCA carried on with their vents and sides in the BTO and TO. The Passenger Department carried out its routine readiness checks on the hauled stock, resulting in the application of the screwdriver to a number of locations including compartment tables, door trim and panelling in the CK and some tidying in the BSK. Foremen using 40 metres of new alkethene pipe and this can now be turned on from the box between line 1 and line 2 opposite the running-in board. For the benefit of our Operations Dept colleagues, the tanks on the hauled stock were filled by way of testing the reconstructed system. Can I remind all staff that part of the purpose of this system is to prevent hoses being trailed along the platforms. The door on Sharon The Cleaning Cupboard has also been repaired to prevent it falling on people's toes. A reminder to Booking Hall staff - ALL vouchers must be collected in exchange for tickets. A wonderful warm and sunny day which tempted out a good number of passengers for our service trains which provided business for the EVRA shop and the Model Railway. Today's photo shows the Bubble Car basking, and gleaming, in the warm sunshine. 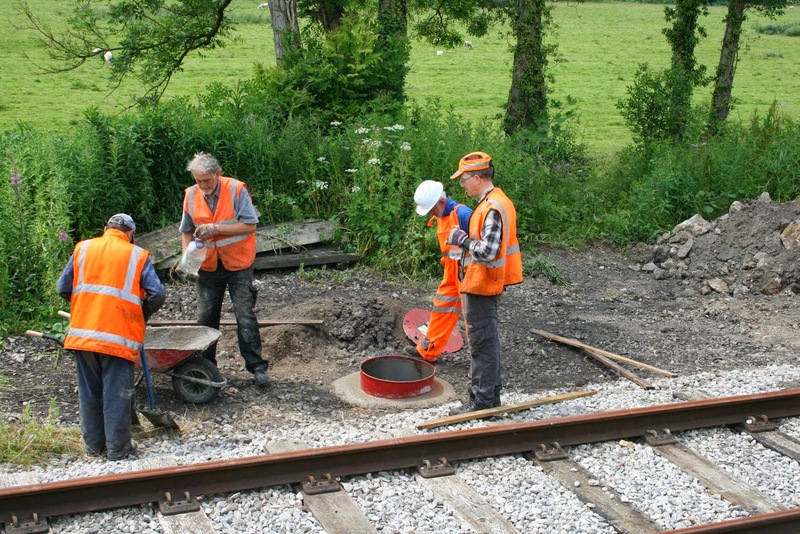 The PWT have been continuing work on the Shottle loop ground frame installations and, at Wirksworth, there has been much preparation for tomorrow's first ever Gold Steam Experience and next week's Network Rail derailment assessment training. This involved the dmu team who also, yesterday, removed a defective fuel pump on 51188 and, today, fitted a new pump and set the throttle after these remedial works together with much shunting. The Booking Halls at Wirksworth and Duffield had a most satisfactory take as did the Pullman Buffet Car that also looked after today's luncheon clients. I spoke to a foursome that had come from Dronfield and Huddersfield who couldn't have been more pleased with their day with us - great train crew and great catering staff - it can't get much better than that. 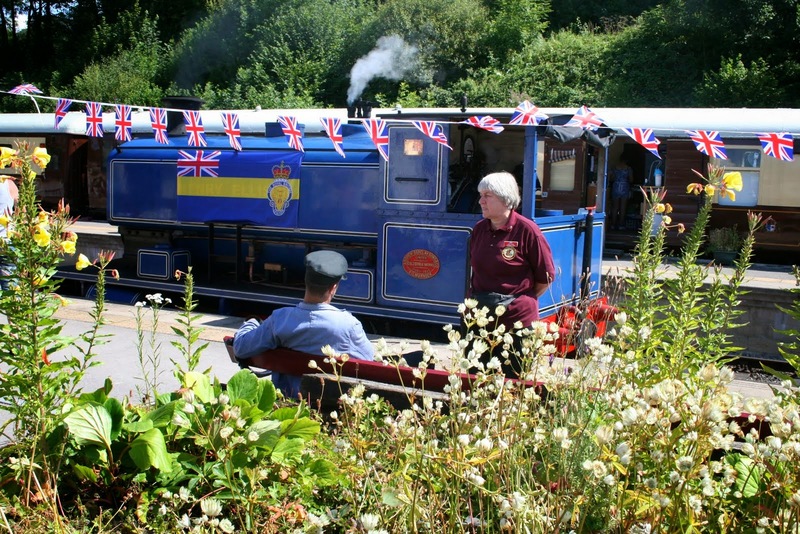 We entertained visitors from a rare collection of other railway enterprises - North Norfolk Railway, Mid Hants Railway, Swanage Railway and the National Railway Museum - all of whom seemed quite taken aback by the welcome given. A most pleasant and reinvigorating day. PS Tonight sees our experiment with a three coah train and steam engine to Shottle which will demonstrate whether this can be achieved or not. Further progress will be announced! Without doubt today's news is the completion of the black top at Shottle and I must express my gratitude to everyone who turned up to help and the entire SBT who have seen their mammoth task draw to a most pleasant conclusion. The team were at rest during my visit waiting for the contractors to get started again but they look particularly happy although Mick Thomas lamented being missed out by the tea run. The PWT contingent carried on with the ground frames and associated rodding runs whilst admiring the concrete benches cast in house to support the equipment. Tremendous achievement which was well supported and facilitated by the Peak Oil team. Back at base the LCC tended to the loco hauled set ready for the weekend and her trainees, husband and son, continued with the renovation of the shelter on Platforms 2 and 3. Not too sure what the dmu team achieved but I know they ensured the two LMS style brakevans were ready for Friday's Gold Steam Experience. There was a lone track patroller that looked after the Gorsey Bank to Ravenstor section. A new scrap metal contractor collected what was in the Wirksworth skip but not amused by the non ferrous content which included two tyres - who thinks they can get away with this? The Pullman Buffet Car welcomed another selection of customers brought out by the mild weather and the Booking Hall dealt with more Afternoon Tea and Luncheon reservations together with a pleasant online Silver Steam Experience request. A most satisfactory and significant day. PS - To follow will be a photo of the Shottle finished product - be prepared to be amazed. PPS - There is a planned experiment tomorrow evening with Henry Ellison taking three coaches to Shottle, running round, and returning to Wirksworth - no one knows whether this will work so times are vague - if all goes well it will establish whether such an adventure will be marketable or practicable and at what cost. Another day of fairly intense activity with our service trains being pleasantly filled with happy passengers and supported by the EVRA Shop and Model Railway. There was good news from Shottle where all preparations that can be done were done for tomorrow's tarmac operation. With the co-operation of Peak Oil, who have been immensely supportive by rearranging fuel deliveries, the gates open at 0815 to give us the best run at completing the task. The PWT have been undertaking their track patrols and hand spraying Wirksworth Yard as part of the unending effort to control weeds. The DST have been putting parts back onto Cathryn's frames and preparing Henry Ellison for its staring role on the first of our Gold Steam Experience days on Friday. 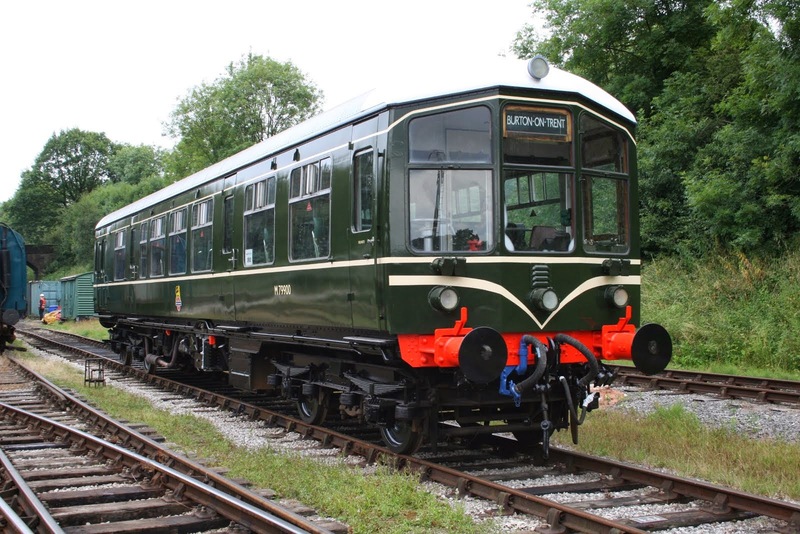 The dmu team have dealt with a problematic EP valve on the Bubble Car, restored the Class 119 to life and fuelled the fleet for its ever increasing workload. John Evans has been busy with the all important documentation including a rewrite of the PTS examination that is now a selection of multiple choice answers that should be more user friendly. 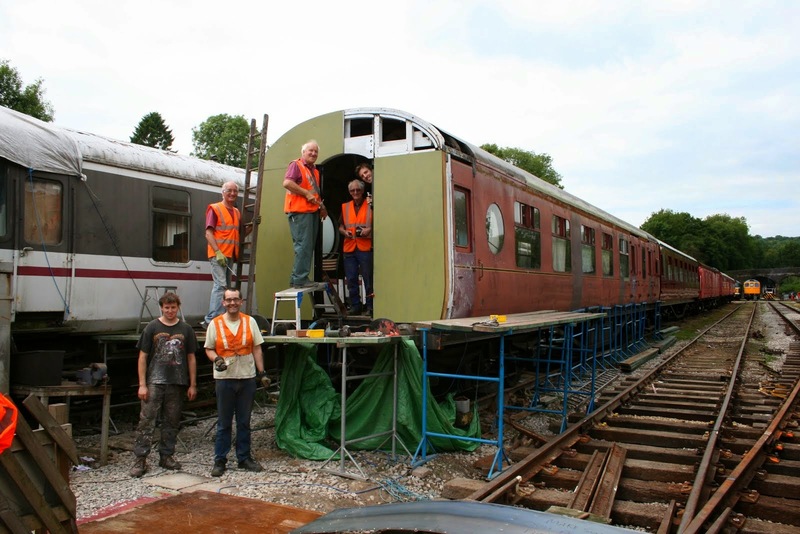 Duffield has seen further refurbishment of the staff cabin there and the LMSCA, who are pictured, made amazing progress with the sheeting of the south end of the BTO as this coach moves on in leaps and bounds. The Booking Halls welcomed our passengers and Wirksworth progressed a further burst of Afternoon Tea and Luncheon bookings. The Pullman Buffet Car looked after today's Afternoon Tea clients as well as our normal range of visitors and customers. Another good and quite hectic day. PS - Any help that can be given to the Shottle project tomorrow will be most welcome - it really is a once in a lifetime opportunity to participate in the final phase of this extensive refurbishment. The SBT have worked long and hard to give us an award winning station under trying circumstances and deserve all our support for this culmination of many months of work. Another manic Monday with the Booking Office processing another load of phone calls, whilst dealing with other associated items. The Pullman saw plenty of customers who came out in the sunshine. 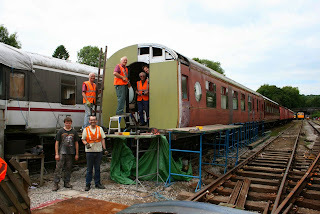 The VCT and flail team were out and about keeping nature at bay for the benefit of all and the LMSCA continued working on the Brake Third coach. A lone member of the DMU team put some thought towards ensuring all of the drivers indicator lights in the vehicles read correctly. This is, in part, as a result of fixing the through-train start on the centre car yesterday. held on the top dock. places were mowed and then strimmed, at least before the strimmer battery coughed. museum to its rightful place in the Booking Hall. glamorous assistants changed a buffer on Fanny, or possibly Johnnie: we get a bit mixed up as both our box vans look the same, and are of course named after Fanny and Johnnie Craddock, for those of you who like doughnuts. with the now familiar selection of people wanting to come "next week"
full and having to be booked in September. lower carriage side steel panelling on the BTO. touches to Iris, notably in the wheel, buffer and door handle areas. until after 9pm. A sweeping brush will be left on the morning train. Two photos showing the Royal Meridian arriving at Duffield with the Class 119 to welcome her. The window picture is all that I managed with the tinted effect but she is the other side! For lovers of trivia I put a string of Union Flags on the fence at Duffield which last saw daylight Saturday 5th January 1963 carried on the smokebox of LNER B1 61299 that worked the last train to and from Pinxton South. These were the 1635 Nottingham Victoria (boarded at Nottingham London Road High Level) to Bingham, 1719 Bingham to Pinxton South and 1855 Pinxton South to Nottingham Victoria formed of Stanier stock - BSK+CK+SK+BSK+S - 51 years ago! Who knows when they will come out again - opening of HS2? Well we can say that another first has passed with HM The Queen pausing en route to Matlock this morning by taking the 0920 Nottingham to Matlock service joining at Derby were she had arrived by Royal Train. The usual train was replaced by a four car Meridian set that formed the all stations service. We ensured we had a presence and the Union Flag was flying! The Komatsu followed our early special train so as to be in position for the Shottle project which included painting of the Down Starter, more fine fill for the platform and further preparation for the ground frame installations. Futter Engineering reported success with L J Breeze which is now returned to full health and I am most grateful to him and Mike Evans who transported an essential part of the plot from Leicestershire. John Allsop completed the roof repaint of the Pullman First Open and it looks much more presentable now. Today's service was well supported and the EVRA shop opened up to welcome our passengers in. The Booking Halls at Wirksworth and Duffield kept the money coming in and the lone VCT representative improved the interior of their container. The M1M continued with the SO and SK and much progress was made with their new 12v electrical systems. The dmu team tended to today's special, evaluated the engine mountings on Iris, formed a new two car set comprising 50170 and 51188 for the weekend and replaced the roof cover on the First Open that had been left open to the elements. The Pullman had another quota of VIP Luncheons together with a steady stream of visitors and passengers. The icing on the cake was a further visit by a customer illustrating his product of laser measurement devices. 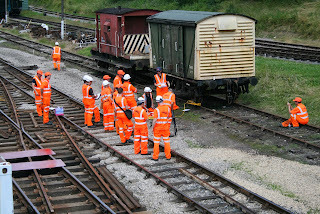 The service train had a slight alarm as they encountered a potential suicide at Callow Park during the passage of the 1415 Wirksworth to Duffield service. Fortunately all ended well for us but I am grateful to the train crew for taking this event in their stride. We entertained another test vehicle today which is illustrated and my thanks go to David Newby for hosting their visit which was deemed by all concerned to be very successful. The second photo shows the PWT transferring S&T parts to Shottle with thanks to the team for manning the Class 33 whilst L J Breeze is poorly. The SBT continued with their preparations for next week's momentous tarmacing of the Shottle platform. The dmu and LCC teams, which were small in number, managed to clean the "Bubble Car" and 2 Car set and effected a wiper blade repair on 55006, buzzer repair on 51505 and prepare a display for the British Legion Day. The PWT also transposed the two steam locos so that Henry Ellison was in the correct position for Friday's experience client whilst the 33 was in action. The LMSCA were out in some force as they fitted more of the wood surround on the south end of the BTO. There was also some serious metal cutting along the length of the west side of the vehicle as rotten panelling was disposed of. The Pullman Buffet Car served a number of casual visitors one of which complained about the noise of the Class 33 whilst the team took tea which was an interesting take on visitors to our Railway that may not necessarily like trains! PS - we will be running a special train at around 0900 tomorrow from Wirksworth which will return as part of the 1115 Duffield to Wirksworth service to celebrate the passing of a distinguished visitor to Duffield and all stations to Matlock. Bring your own Union Flag. Firstly may I add to the accolades for Geoff Clark for organising another splendid Classic Bus Rally last weekend which had a good effect on our coffers reflecting the hard work put into the event. Mr Mango certainly added his own special ingredient to the delight of all the participants. Today saw a modest Tuesday with the service trains supported by the EVRA shop and model railway. 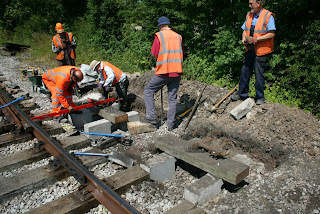 The photo shows the Down Starter Signal for Shottle being manufactured from various parts including the signal post previously located at the base of the Incline. The welding rod is being held by Doug Futter who has also been masterminding the injector repairs and return to service of L J Breeze. A further small problem has been revealed which we hope is capable of being economically resolved. The dmu team have been undertaking a variety of tasks including preparing today's service trains, rewiring the 3 Car set, fitting wiper motors to Iris and recovering buffers for their fitted vans. The DST have been preparing No3 for its annual boiler exam and the Cathryn team reported that they had been preparing the bar equipment for the locomotive, with optics, but I think they carried on with the fitting of refurbished parts to the frames. The LMSCA concentrated on the scissor apparatus which is part of the south end corridor connection on their BTO. The PWT, in addition to the signal post manufacture, loaded the ground frames destined for Shottle together with the completed signal post. 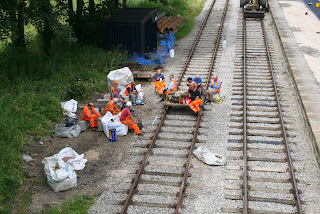 The SBT, aided by members of the PWT, completed the final fill of the back of the platform and made good progress with the fine stone on the main part. A further two benches were cast leaving two to be done for the ground frame installations. We welcomed a delightful Brazilian who is part of the team investigating the eventual automation of Shottle loop as part of her Masters Degree from Birmingham University. This is a long term project that will be tested on the new crossover at Wirksworth before being declared fit for purpose. Fred & Iris gave the Mess Hall their Tuesday cleanse and John Evans, after degreasing Gorsey Bank gates after an overenthusiastic treatment, continued his quest to update our personnel records. The Pullman Buffet Car had another appreciative group of Afternoon Tea customers together with our regular volunteers and passengers. The Booking Halls at Wirksworth and Duffield had a modestly successful day with Wirksworth dealing with a seemingly unending number of telephone booking requests. Relative calm around the place today after the activities of the weekend but nevertheless, busier than the Mondays of old. The Booking Office was kept busy by a constant stream of calls as well as organising events coming up. Other members of the Passenger Dept continued painting the shelter on Platform 3. Down the yard, the LMSCA continued working on the end of the Brake Third coach whilst work was done on the incline with the flail. Mick Thomas ably hosted the test customer also. the vintage bus services to Duffield and the circular tours of Carsington went extraordinarily well. We were also delighted to see the Battle of Britain Flight's Dakota on a flypast this afternoon. electricians continued to address the mixture of small but irritating faults which have affected the air con in the Pullman First Open, and are gradually problem solving their way through these. Bramson Stokes Enterprises engaged in an afternoon of woodcutting followed by the construction of a section of revetment and path gravelling at a station between Idridgehay and Duffield. removal at Derby Bus Station. What a glorious day and fantastic start to our Heritage Bus weekend. Our train and bus services to Duffield were very busy and extra steam services to Ravenstor were inroduced to cope with passenger demands. The model railway too was well visited and passenger queues formed at the narrow gauge as 'Lenny the Lister' coped with full loadings throughout the afternoon. Unfortunately No. 3 suffered a fractured gauge glass mid afternoon and was replaced by our trusty 'Bubble Car'. I'm happy to report the gauge has been successfully repaired and the locomotive is again fit for traffic. Down the yard both Oaks enterprises and the 8F group were busy on the Duke's restoration and up at Ravenstor Anton tackled the excess vegetation around the path to the stone centre. Our buffet was also very bus keeping our guests suitable fed and watered. Today's photographs are of a small group of 'sixes drivers' from our friends at trentbarton on a busy Wirksworth station platform and 'Mr Mango' entertaining our younger guests during the incline service. A most enjoyable and rewarding day! Today's test customer ably hosted by Tony Watt. Owing to extreme activity today's photo is from not very long ago when L53 visited Idridgehay on the 8th August 2008, only nearly 6 years ago! Today was the first of our summer Thursday service which was quite well supported and my thanks go to Michael Perkins who stepped in at the last moment to cover the Duffield Third Man's position. This under appreciated job is essential to our service and is the most physically demanding so he deserves all our thanks for keeping the wheels turning. The dmu team concentrated on the fitted vans that will form part of the Multiple Memories weekend that will require some exchange of buffers to ensure they are safe to operate. These are being sourced from the static brakevan used for our lamp display. The team proved that the vacuum brake works on these vehicles. 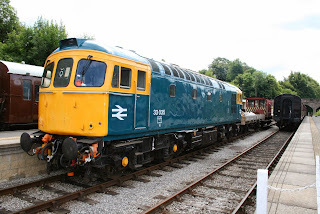 Filters were changed on 55006 and 50599 was prepared for its role as a trailer for steam operations for the weekend. 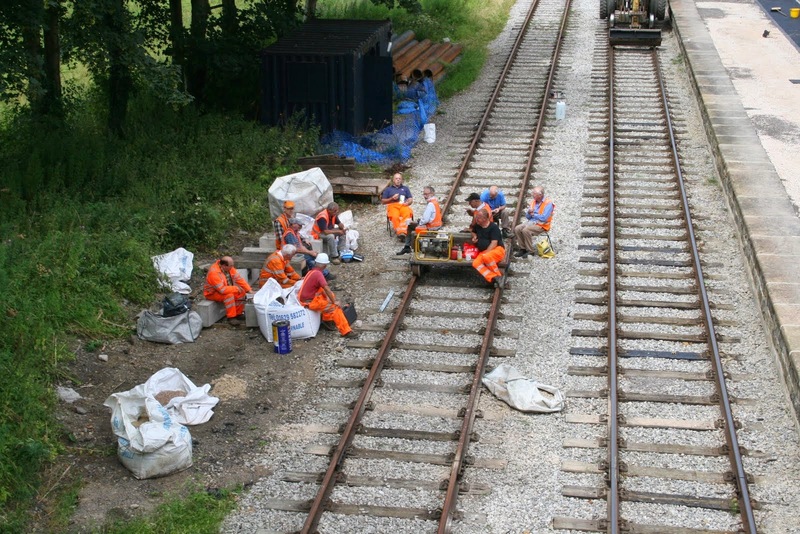 Reinforcing bar delivered to Wirksworth was transferred to Shottle after being cut into sections for the formation of concrete benches for the loop ground frames. Four out of the required 8 have now been cast representing another exhibition of the ingenuity of the team involved. The SBT took delivery of the material to provide the final fill for Shottle platform and this was delivered to site for spreading next week. A strategic pipe was laid for the signal wire to pass under the foot crossing north of Shottle station. Work was ongoing on the steam heating for the EVRA Mark 1 coaches and Duffield achieved weed treatment of the former down slow platform which is now our footpath from the footbridge to our platform. Repairs were progressed to the wagon display at Ravenstor and the Pullman Buffet Car dealt with another 26 lunches to great effect together with today's passengers. 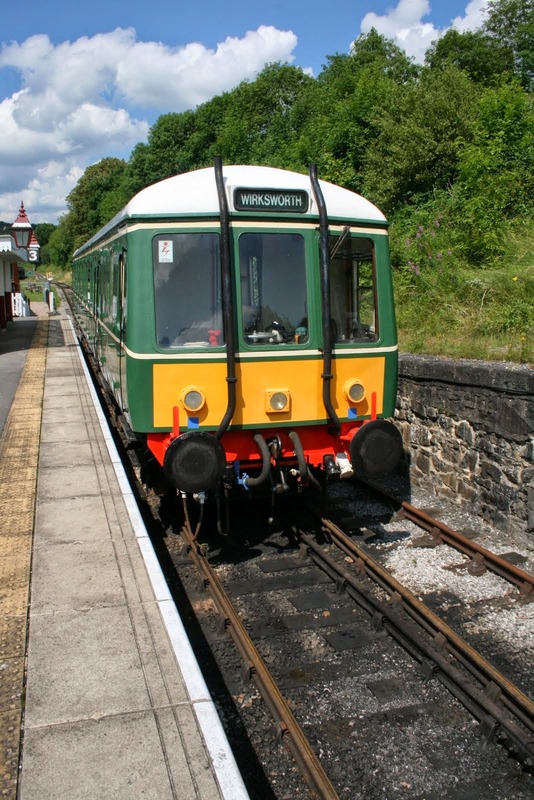 The Booking Halls had a most satisfactory day and Wirksworth added to the group bookings that steadily top up the passenger numbers on our planned service trains. A dull but dry day that encouraged us to believe our move to Thursdays was a correct one. Owing to extreme excitement yesterday was not credited to Wednesday - I feel no guilt as Dolly loves me and will love me for ever especially from 9 to 5! An early report as I sparkle up to meet Dolly later this evening! The SBT and PWT joined forces again with the Shottle platform and loop projects. The team created a splendid hole and are seen looking into it - this will be the site of Shottle's Down Starter. 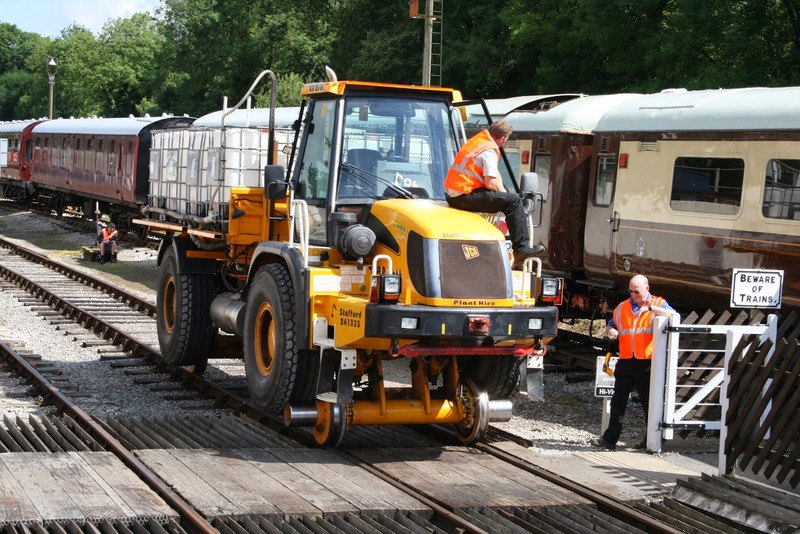 The SBT have rolled the stone on the platform and are awaiting a final ten tonnes of fine to dust stone as a final topping prior to tarmacing which now scheduled for 16th July. Tremendous work by all concerned. This week's track patrolling was completed with a walk through from Gorsey Bank to Ravenstor and the dmu team gave the Pullman exteriors a good clean so they gleam again. The team also fixed problems on the 2 Car set 51505+50599 ready for the first Thursday service tomorrow. 50599 was brought into the platform so that the LCC could clean for its work with No 3 over the weekend. The LMSCA continued to take advantage of the good weather to progress the south and gutters on their BTO. The Pullman Buffet Car received visitors brought out by the warm sun and the Booking Hall continued to book teas and lunches together with sundry other online products. A dreadful omission from yesterday was the continued efforts of Fred and Iris who tended to the Mess Hall and their flower displays. Now where is that blond wig? There was a track patrol between Duffield and Shottle and after this Doug Futter, having devised and manufactured an extractor, removed an offending injector from L J Breeze which had been leaking valuable fuel for some while. 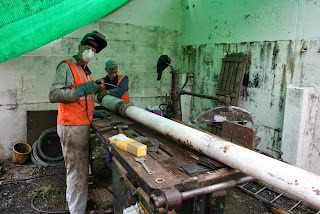 I never ceased to be amazed by the skills we have amongst the team and it is hoped that the injector can be refurbished and replaced in the loco in the near future. The PWT and SBT have been beavering away at the Shottle platform and ground frame project as tarmac day rapidly approaches. One of today's photos shows the LMSCA BTO with two of the team allegedly having a technical discussion but much progress has been made on the gutter work of the vehicle and within the interior of the TO. The DST have been cleaning and polishing No3 and Henry Ellision together with a sort out of their stores. Cathryn has reached the stage of replacement of parts to her frames and the second photo demonstrates the restored reversing lever. The dmu team have turned their attentions to general site work by clearing the car park of our road/rail vehicles to maximise space for the upcoming classic bus weekend and ensured the stock was also ready for what I hope will be a busy two days. They also oiled and greased our two FVs (Fitted Vans) that will form part of the set pieces for the Multiple Memories weekend. The Pullman Buffet Car had a good day with a full house of Afternoon Teas, the Driver's Apprentice lunch and our general passengers requirements. The Booking Halls had a satisfactory day and another steam experience added to the general wellbeing. All in all another good day although it is frightening we are now half way through 2014 - soon be Christmas!